Let's have some fun in fantasy baseball card land. Pretend you have $3000 or $4000 to spend on a card or cards from the 50s (or late 40s I suppose). What would you buy? High grade? Low grade? One really high grade, high quality card or several low/mid grade cards? 2. The best 1950 Bowman or 1952 Topps Jackie Robinson I could land in this price range. Or both if they weren't high grade. Or.. I could keep going. It's fun to dream! What would you guys get? Last edited by vintagebaseballcardguy; 03-30-2019 at 09:53 PM. 1952 Bowman Mantle in EX condition. Then with any money left over I’d probably start my 1955 Topps set (maybe get a nice Jackie Robinson). A 1952 Topps Eddie Mathews, without question. I don't know that it would be enough money to get one, but I would buy a 1954 Wilson Franks Ted Williams. I've wanted one of those since I was a kid. Adam, 45 years ago I was a raving Ted Williams collector, and the number one dream card on my list was the 1954 Wilson Franks Ted Williams. I wanted one so bad ......... Short to short, I came oh so close to buying a nice EX-MT specimen at the 1974 Midwest Sports Collectors Convention at Troy, Michigan. The experience was so heart-wrenching to me as a collector, I wrote a chapter about it in my book, NEVER CHEAPER BY THE DOZEN. It's the twelfth chapter, "The One That Got Away". One major, major and sad . To this day, I cannot laugh about it, or think about it very long. Wishing the best in your pursuit of the very finest Teddy Ballgame ever printed. A signed 1953 Topps Vern Stephens. He’s sort of the forgotten man of the late 1940s-early 1950s Red Sox teams, and I think if he had a couple more good years he would’ve made it to Cooperstown. In the 1990s I saw an incredible WF Ted in a shop in downtown Boston. It was raw, the owner who was and is a very legit card guy called it NM MT and to my eye it was. I balked. I have a nice 4 now, but that card just blew it away. Probably my worst non-purchase ever. Last edited by Peter_Spaeth; 03-31-2019 at 09:28 PM. I'd pick up the nicest signed Mantle I could in that range, ideally a 53 bowman or topps, or a 56. I'd gladly take a 51 or 52 if anyone wants to sell one for 4k. If it was any 48 or later I'd get a 90 Thomas no name on front. Last edited by pokerplyr80; 04-01-2019 at 12:09 AM. For post war, the 1949 Leaf Paige. For pre war, the E95 Honus Wagner. 52 topps mantle. a childhood dream to own one. Much like I don't like to go over my 1952 Topps Mickey Mantle encounter in 1974 for $75.00. Sent away $75.00 for the card and received a Sandy Koufax rookie, a 1951, 1956 Campanella, 1951,1955 Warran Spahn, 1951 Yogi Berra and a $25.00 credit memo. Talk about a scam and a ice pick in the eye that has lasted 45 years. Now the 52 topps Mantle is the only card I really need in my collection to feel whole. LOL ! Not sure I am going to pay 10-50K either? I collect Mets so there is nothing from the 1950's I'd want but fitting the title I want a 1969 NY Boy Scouts Tom Seaver. My #1 want as far as post-war cards is a '59 Bazooka Billy Pierce. Not that they are hard to find, or terribly expensive, but they only seem to pop up when I've committed my hobby budget to something else. I don't pour a lot of money into the hobby so if I had some 'free' cash come my way that's the card I'd grab. Then I'd find a 1959 Topps Venezuelan Ace Hurlers #156 (Pierce and Bob Friend) and I'd put my Pierce collection to bed once and for all. I've been fortunate to build a hell of a collection, primarily HOF/rookie cards from all eras 1930 to modern. But from where I sit now (and can't afford LOL) I look forward to the future to collect some T206 era cards, WaJos, Ty Cobbs, LaJoie.. whatever I can find and afford in the future. Before joining this forum, I never knew or had any idea what an amazing community/appreciation/demand there was for the early 1900's baseball cards. It's an era I want to learn more about and hopefully collect some cool pieces in the future for sure. The smart move would be to take that money and over time fill in a lot of my vintage Cubs holes in mid-grade - but judging by my purchases over the last 2 years or so - I'd probably go out and buy a really nice '67 Seaver or something like that. Er, then sell it at a slight loss less than a year later. I go through periods when I don't sell cards for years - then fickle times when I sell things left and right. Last edited by jchcollins; 04-02-2019 at 12:43 PM. 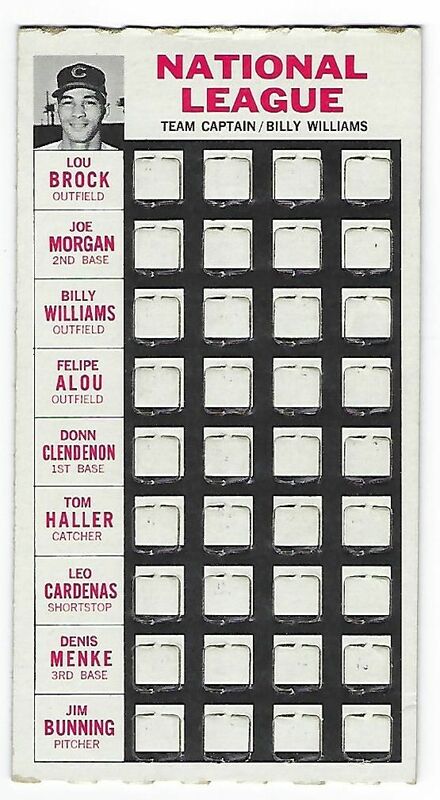 1967 Topps Punch-Outs Billy Williams, I have yet to see one in any condition for sale in the last 6 years. I would also like to find a 1968 Atlantic Oil Billy Williams, but since it was a winner card guessing they were all redeemed and none exist. That is beautiful! Let me know if you ever want to part with it. 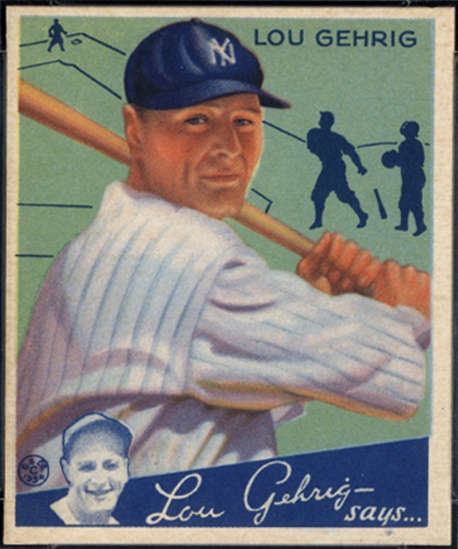 A PSA 6 1934 Gehrig #61 is my ultimate dream card. This would be my choice also. Tough to find a 1954 Wilson Frank's Ted Williams in descent condition and reasonable price. I might go for the 1946 Pararde Sportive Jackie Robinson.